Halogen vs. 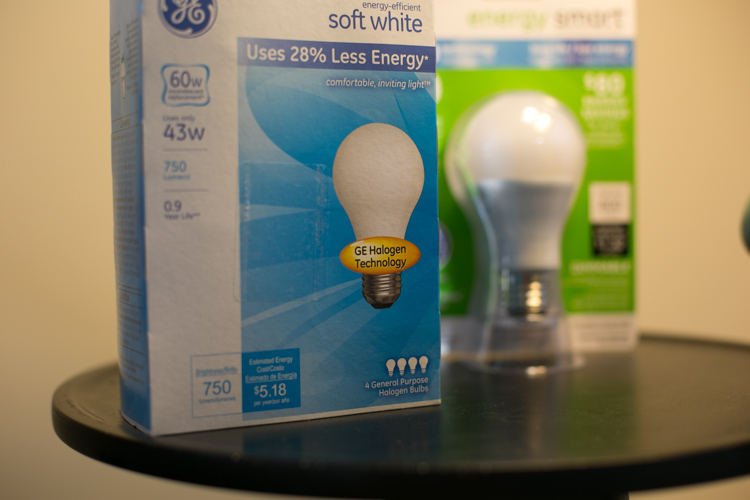 LED light bulbs: Which is the better replacement? There’s a room in my house that currently has eight 60-watt incandescent light bulbs (i.e. the kind that have been commercially available for nearly a century now). Scratch that. It has seven. One blew. Now I have to replace it. Since new laws went into effect on January 1st of this year, old-style incandescent light bulbs have been harder and harder to come by. Contrary to public opinion, though, they have not been completely banned. Stores are still allowed to sell any inventory they have left, and you can still find many wattages online. 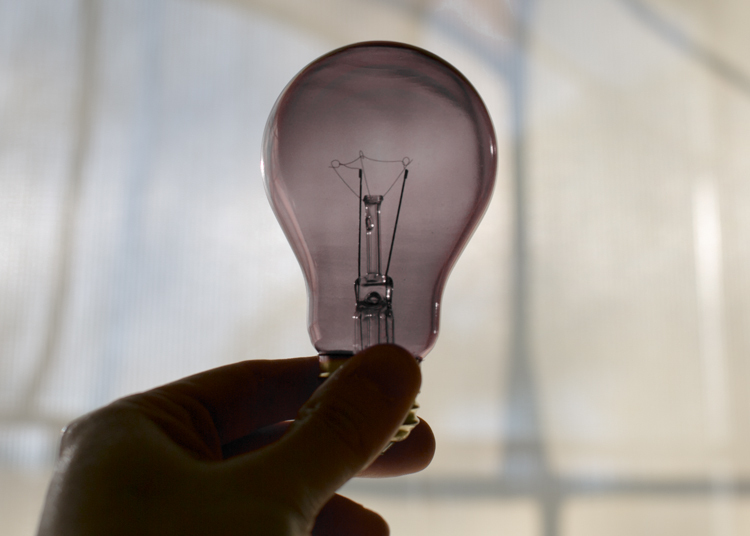 Another thing people are frequently mistaken about: The “ban” still allows for new incandescent bulbs to be produced, they just have to be more efficient. For example, a bulb that used to take 60 watts to produce light now needs to do the same with 43 watts. Also worth noting, the law has a lot of exemptions, which can be found here. So the question now before me: Which new-style bulb will blend in best with my 7 other incandescent bulbs? So off to Target I went, to see what they had. Two bulbs stuck out. First up, a halogen/incandescent hybrid made by GE. At first glance, you wouldn’t notice any difference between these bulbs that use hydrogen and the traditional bulbs they replace. 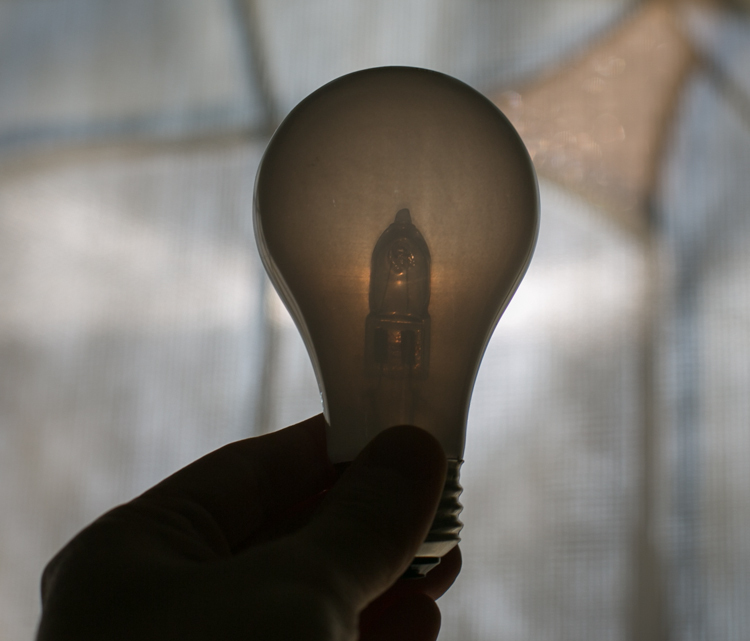 In fact, you can only see the difference when you take a look inside the bulb. The difference? The halogen bulb appears to have a tiny condom in it. In terms of performance, halogen bulbs are just efficient enough to meet the new standards. The 60w equivalent uses exactly 43w. The halogen bulbs share the major benefits of their incandescent brethren: 1) They are also completely dimmable and 2) They spread light evenly in all directions. They also share a major detriment: a relatively short life span. And if you’re looking to lower your home energy bill by a few bucks a month, this isn’t the bulb to do it, since it’s the least efficient of the replacement technologies. 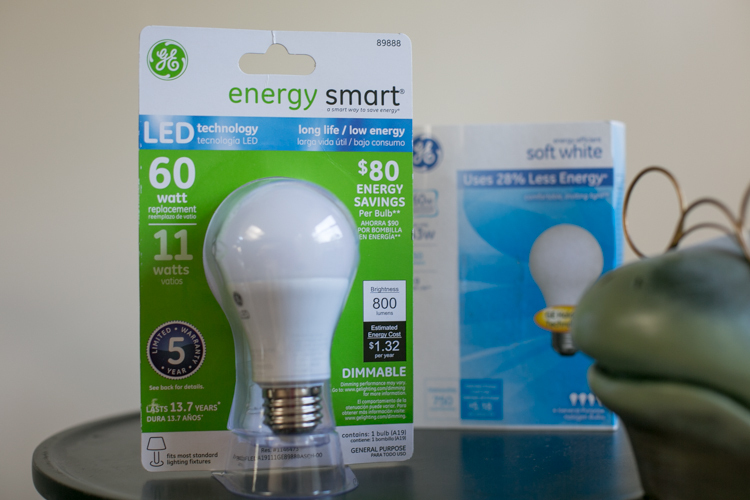 Next up was an LED bulb also made by GE, in their “energy smart” line. The bulb is one of the most “traditional-looking” LED bulbs yet. It has an aesthetic that evokes an old-style look while coming off as sleek and modern. The bulbs are heavier, but no bigger size-wise and can be used in just about any fixture where’d you use an incandescent bulb. 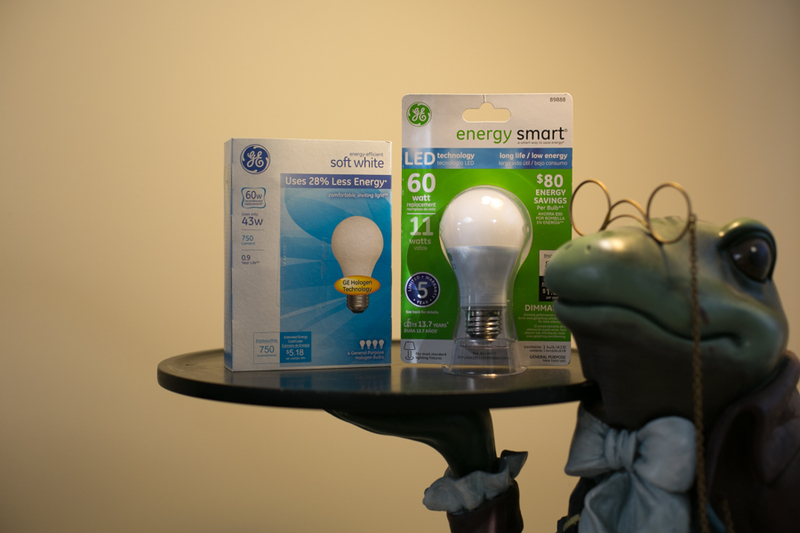 LED bulbs use a lot less electricity and last 20 times longer, so the savings (especially in the long term) will actually be noticeable. They are also dimmable, but that comes with a big caveat. The current crop of LED bulbs only dim from about 20% to 100% brightness. What that means is if you put one in the same fixture as an incandescent bulb and hit the dimmer switch, they won’t stay evenly lit except at the highest levels. At 20% of the power or less, the LED will go completely black while the incandescent will still produce some light. Which one did I buy? Both. But I wound up using the halogen bulb in the room with the seven other incandescent bulbs. Why? Because they’re all attached to a dimmer. No one can see the difference. The LED still has a place in my home, though. Just not with any older siblings. Note: No matter what technology bulb you buy, when trying to match bulbs already installed in your home, ALWAYS make sure to check the color temperature, as that’s what counts most. Soft white bulbs should go with soft whites, daylight bulbs with other daylight bulbs, etc. If you really want the closest match, look on the package for the numerical color value, which is measured in kelvin. ← So you want to get an iPad. Which one is best for you? With my vintage 2008 Radio Ra Lutron system the only bulbs compatible are incandescent and halogen. So I have opted for halogen rather than replace this $6,000 system. Radio RA allows me to regulate my lighting by room, by fixture. and provides the opportunity to create lighting scenes for “away” or “entertaining” “bedtime” for example by a push of a button at the door or at your bedside. I have LED in my master closets and I find that they take several seconds to light up. (they are in open fixtures). Any idea why this is happening? My LED outside my garage is gloriously bright and great for safety as my garage backs up to an alley. It works on a light sensor. CFL bulbs are in all my lamps that do not require anything decorative (decorative incandescent are still permitted for sale) and in my balcony and porch ceiling fixtures.None of these are on my Radio Ra. I would think about switching to LED, but they are very pricey and I would probably have to replace them ALL at once so color matches. Hi Eric, you do great reviews! I have a wireless switch product you might like to review. It’s meant to replace all wired switches with a simple point-to-point switch + controller. Why run wire in the wall for a new switch when you can do it reliably without wire? I couldn’t find an email address to send this to, but if you’re interested please email me and I can give you more details.